When I first opened the email asking me to be featured as Tank of the Month, I thought it was a joke. 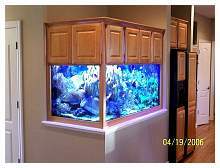 Even though this is the biggest honor I've had in all my years of keeping marine aquaria, I really feel there are more deserving tanks out there. 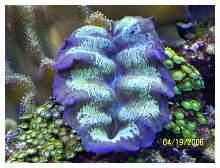 Nevertheless, I have taken what I feel is a different approach from what so many are doing nowadays, with small-polyped stony coral-dominated tanks, and have instead focused primarily on an all soft coral system. 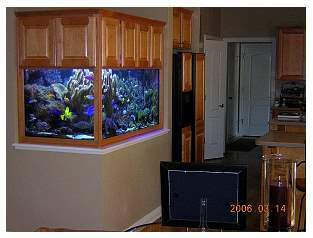 I started my aquarium hobby a bit differently from most aquarists. In fact, I originally had no interest in it at all. It began when my wife surprised me with a small freshwater tank as a birthday gift. 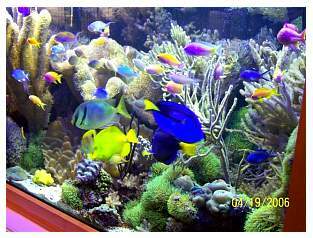 When asked why she picked an aquarium for me, she replied, "Let's go to the fish store and just pick some fish out and give it a try." Little did either of us know the damage that would be caused by this trip! 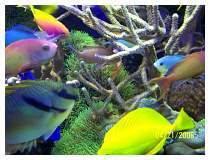 Once in the store, the marine fish on display instantly fascinated me. 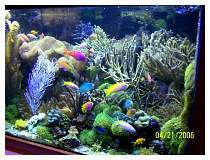 I dabbled in freshwater fish for a couple of years, but I knew someday I would be keeping a marine aquarium. 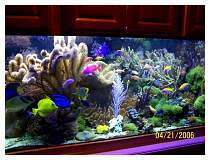 From that small 15-gallon freshwater tank, I quickly went to a 55-gallon tank followed by a 75-gallon, a 180-gallon and my current 260-gallon tank. 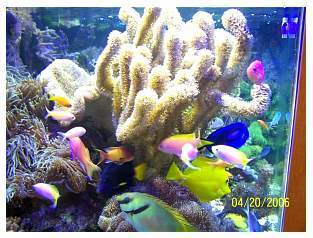 I'm now in my 10th year of keeping reef aquariums. 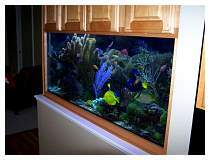 My current aquarium is a custom-built Oceanic tank that measures 60"L x 36"W x 28"H. It has a powder-coated stainless steel frame that makes it very nice not only for light penetration but also for working in the tank. One 3" strip that runs down the tank's center is the only brace. The tank has two 2" holes drilled in the back glass for overflow drains. I have always preferred this kind of overflow to the normal corner box for aesthetic reasons and because it allows more real estate for livestock. 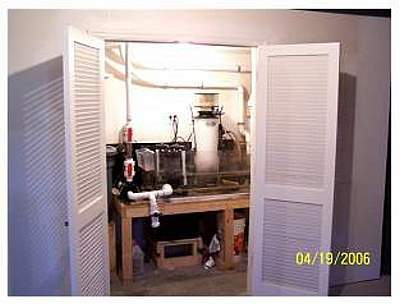 Other unique features of the system include two viewable sides and a dedicated filter room in the basement. 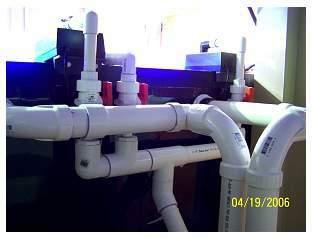 One feature I wanted when I planned this tank was to keep all filter equipment in a separate location. 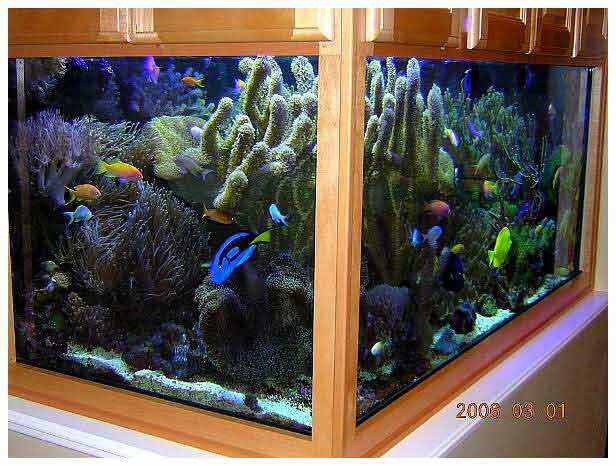 With my past tanks, I was always fighting the space constraints under the main tank's cabinet. I really wanted to have the ability to expand for more equipment as time went on, if the need arose. 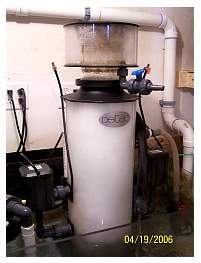 The system's main filtration is a Deltec AP 902 protein skimmer. 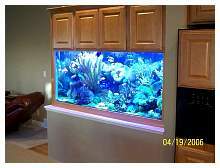 I recently installed this unit mainly due to the tank's high bioload. With my passion to keep adding one more fish, I felt that the former skimmer I had was unable to adequately remove enough organics. I couldn't be happier with this unit's performance. 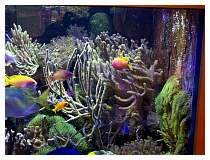 Along with the skimmer I also have installed a My Reef Creation's phosphate reactor. It usually contains about 500ml of phosphate media, which I change every four to five weeks. 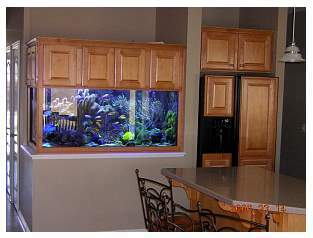 Again, with the number of fish and the amount of food I add daily, I felt a bit of added security with this. 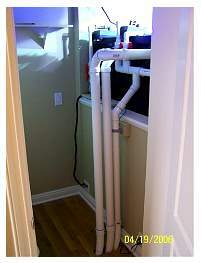 The main pump on the system is a Dolphin 4700, which takes water from the lower basement sump and sends it upstairs through three outlets into the main tank. With roughly 12' of head pressure, I figure I'm receiving about 3000gph into the main display. 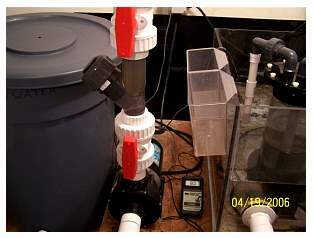 The three outlets are split between two 3/4" Sea Swirl devices and another outlet positioned lower in the back behind the rockwork to add more circulation in the lower part of the tank. A large 1½" Swiss made check valve is mounted directly above the main pump to prevent back-siphoning in the event of an electrical outage. 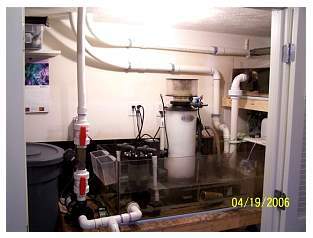 A 48"x 24"x18" sump holds the skimmer, phosphate reactor and chiller coil. I had the sump made at a local acrylic shop and even though it's not fancy, it does the job at hand quite well. 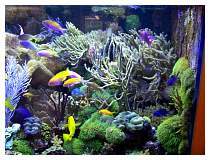 A refugium was added about six months ago in the hopes of adding a natural filtration method, as well as providing another food source for the fish. 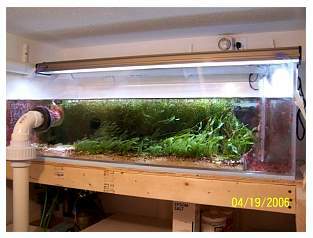 The refugium measures 48"L x 22"W x 16"H. One of the tank's 2" main overflow drains goes directly into the refugium. 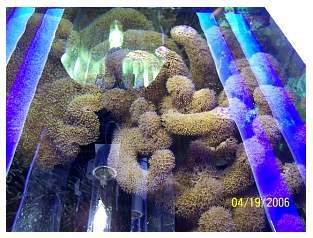 After making its way through the macroalgae, the water then drains into the sump, is processed by the skimmer and is returned to the main tank. Contrary to what many people believe, this system requires a large amount of additives to stay healthy. 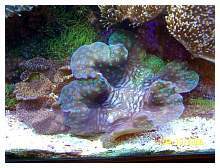 Much discussion has been written about the benefits of a calcium reactor for stony coral-dominated tanks. 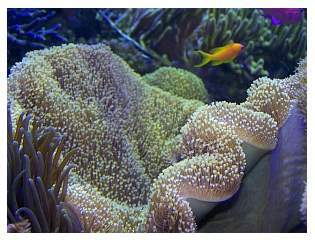 Few have actually realized its benefits on a soft coral-dominated tank. 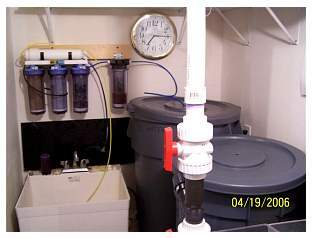 I installed a Korallin 3002 calcium reactor about a year ago, and even though it has benefited the system, I feel this unit is undersized for the tank's demands. 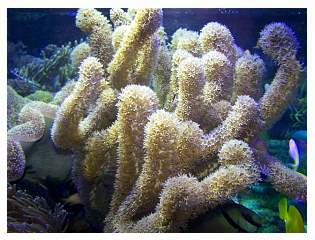 With the large numbers of soft corals and their heavy growth patterns, I still need to add additional calcium and magnesium in the form of kalkwasser, calcium chloride, magnesium sulfate and magnesium chloride. I may need to purchase a larger reactor in the future to better handle the load demands. 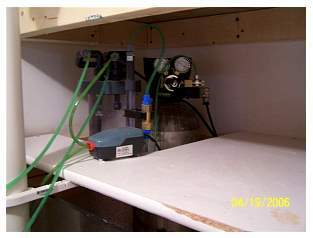 A ½ horsepower Aqua Logic chiller was initially installed to keep temperatures in a safe zone, and the temperature now typically stays in the 77 - 79°F range. A five-stage SpectraPure RO/DI unit makes all top-off water for evaporation and water changes. A GenX pump is also hooked into the tank via a closed-loop system that's fed back into the main display through a third ¾" Sea Swirl. A Pinpoint pH monitor keeps track of the daily pH range, which usually varies from 8.0 - 8.25. 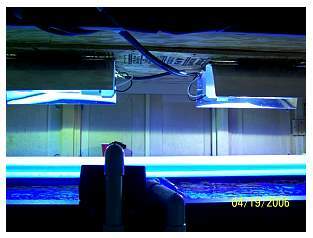 Lighting consists of two 400-watt 10K Ushio metal halide bulbs powered by a Sunlight Supply ballast. 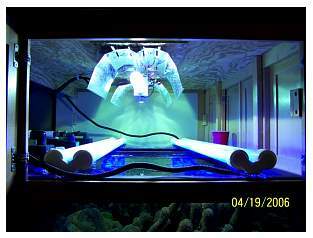 Supplemental lighting is provided by four 140-watt VHO actinics. 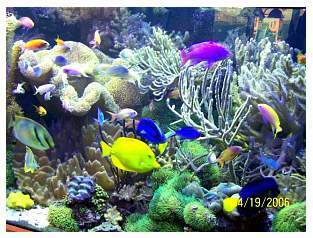 The combination of halides and VHOs really makes the tank visually appealing and facilitates the corals' good growth rate. All bulbs are changed on a 12-month rotation to keep the light intensity from dropping off. The photoperiod begins with the VHO actinics coming on roughly 30 minutes prior to the halides at 1:00PM. 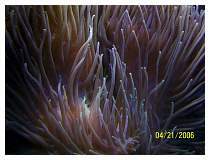 The halides run for approximately nine hours followed by 30 minutes of VHO actinics. 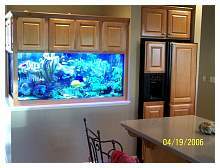 The refugium's lighting is on a reverse-daylight cycle from the main display and has two power compacts as its light source. 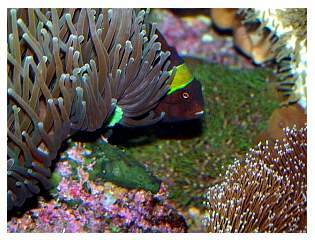 I rarely test for ammonia, nitrate or nitrite as the system seems stable with regard to these parameters. All tests are performed with Hach test kits. 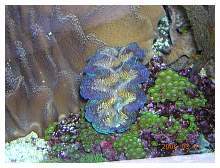 My last 180-gallon aquarium housed a wide variety of corals including large-polyped stony corals, small-polyped stony corals, soft corals and clams. 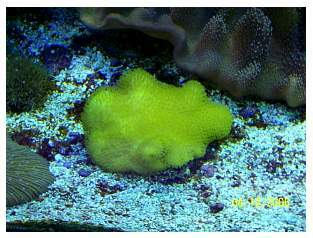 After several bouts of trying to keep the small-polyped pieces happy, I decided I would try an all-soft coral tank. 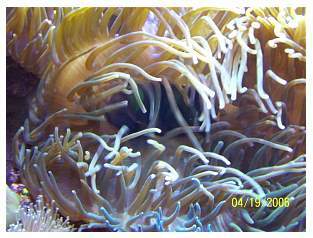 I really like the movement of the gorgonians, Xenia and star polyps in the currents. 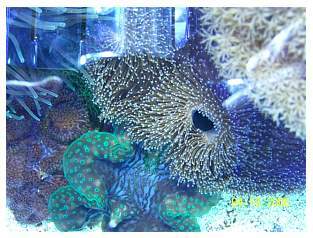 Current inhabitants include several large Sarcophytons (one piece is almost 26" across), Sinularia, Anthelia, Xenia, green star polyps, numerous mushrooms, clams, Clavularia, gorgonians and anemones. 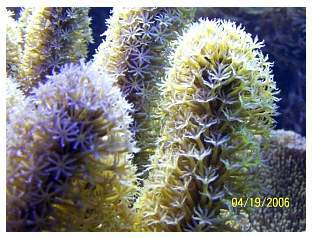 I'm not really into precise coral identification, but rather the coral's shape and texture. 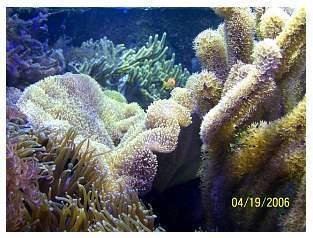 Although the tank may not have the bright, vibrant colors of a full-blown small-polyped stoney coral tank, I feel the corals' shape and movement make up for it. 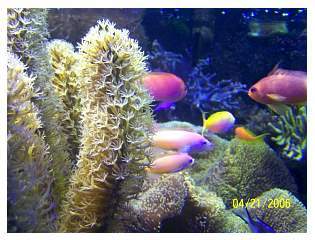 I'm not one to trim corals much; I like the thick, natural look. 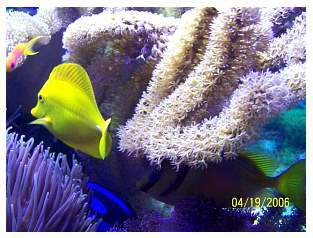 The funny thing about the fish in this system is that just a few years ago I was almost against keeping fish in my reefs. Now, I'm approaching the 60 fish mark! 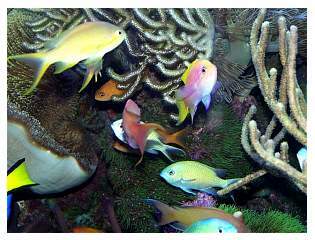 The main population of fish is Anthias species. 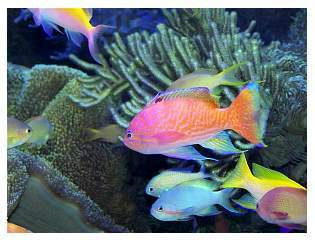 These fish simply fascinate me. 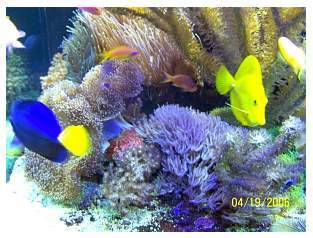 They have tons of color, movement and personality. 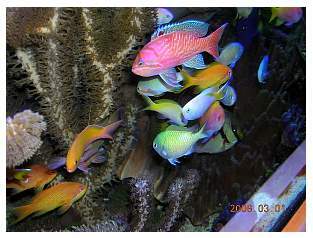 Current Anthias species include: Pseudanthias hutchi, P. squamipinnis (from various collection locations), P. bicolor, P. bimaculatus, P. caraberry, P. bartlettorum and P. pleurotaenia. 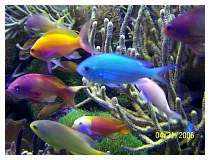 My favorite is the Pseudanthias bimaculatus. 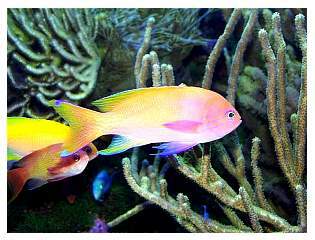 The male is the boss of all the Anthias and both the male and females have great coloration. 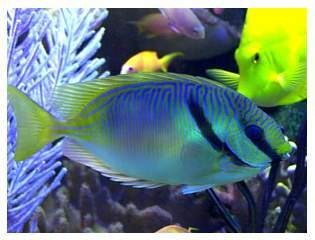 Other fish include a yellow tang, purple tang (both in my possession for over eight years), Paracanthurus hepatus tang, maroon clown, copperband butterfly, both green and blue Chromis and a large rabbitfish. 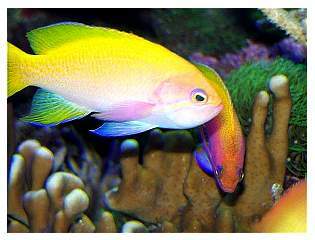 Feeding consists of a combination of frozen foods - mysid, brine, bloodworms and daphnia, along with nori, which is fed twice a day. Most people are really surprised with the amount of food provided daily, but I feel with the number of high-energy fish I have, this is right in line with their needs. 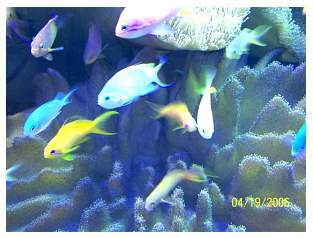 Basic tank maintenance includes top-off from evaporation with kalkwasser (roughly four gallons per day) and additives as needed. 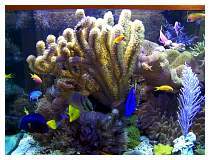 Once per week I perform a 25-gallon water change. 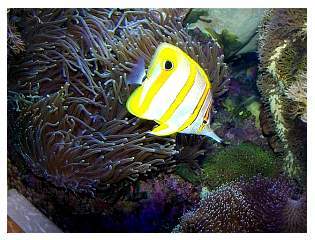 This might seem excessive, but with the large load of fish and the heavy feedings, I feel it is something not to overlook. The skimmer's cup is cleaned two to three times per week to keep the skimmer performing optimally. 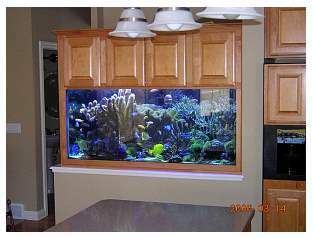 Other than that, the tank is pretty much self-sufficient. What does the tank's future hold? Well, in retrospect, I feel that a number of changes would further enhance the tank's health. First is improving the water flow. 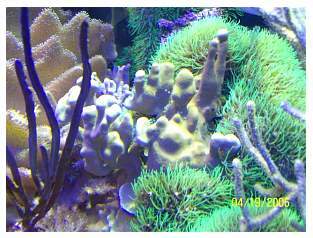 As the tank has filled in with corals, I can see that I didn't plan accordingly in this area. 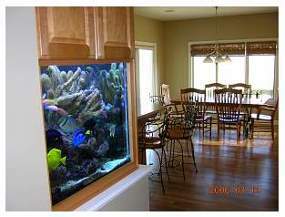 I intend to enhance water flow by installing another circular loop through the back of the aquarium. 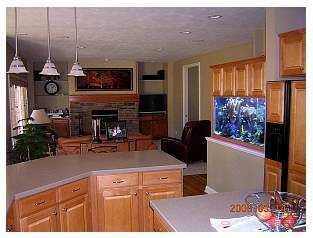 The second change I think would be beneficial is the openness of the rockwork. Even though I didn't overload the tank with liverock, I still feel I could have done a better job creating more open space through the reef's structure. 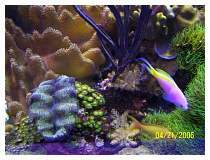 As time goes on I can see myself taking the tank down to thin the fish population and trim back many of the corals. 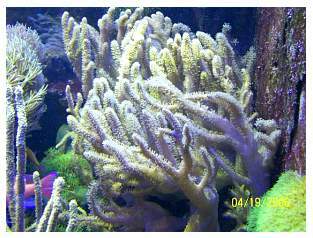 Last of all, I feel the need for more space for some of the larger coral pieces. Plans for a larger system are always rolling through the back of my head. 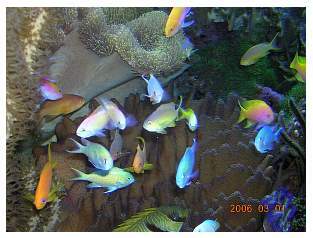 Little did I know 12 years ago when looking into that 15-gallon tank that today the 260-gallon would be packed full of marine life! I'd like to thank some people who made this system a success. First, thanks go to my wife for tolerating all the times I've pushed the envelope for my hobby. 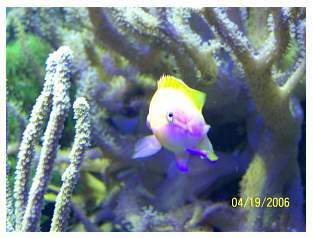 Many thanks to my friends and neighbors who have helped me through difficult times and by "fish sitting" when I am out of town. 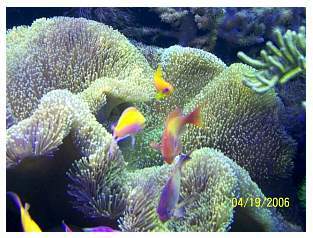 Last, but not least, I want to thank all those from Reef Central and members of the Omaha Marine Society for all their good advice through the years. Some of my best friends have been made through this wonderful hobby!